Emercoin is a blockchain platform. Since 2013 it has developed a wide range of easy-to-use dSDKs. dSDK (Decentralized Software Development Kit) is a set of software development tools that allows the creation of software, services and solutions. Usually, it includes APIs, technical documentation and parts of code for fast and easy development on a certain platform. dSDKs are already implemented in numerous innovative technical solutions built on the blockchain. 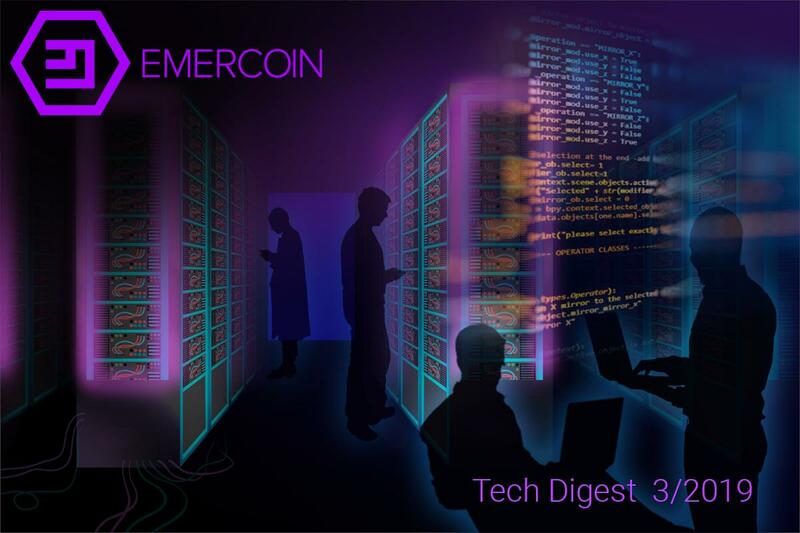 Emercoin offers services that have a potential to change the way different industries operate, providing means for data protection, secure storage of information, and creation of distributed services. Emercoin’s Name-Value Storage is a simple yet powerful concept that allows you to store arbitrary data within the blockchain. This has already allowed a range of distributed services, from a decentralized network. Although Emercoin supports traditional PoW mining and merged mining with Bitcoin, its main mechanism is Proof-of-Stake mining. This eliminates the “arm’s race” for mining capacity. Emercoin will never sacrifice security for flexibility. Unlike “smart” contracts, which have already caused multi-million scams and security compromising in the past, Emercoin’s NVS logic is not Turing-complete and cannot be used to write malicious code. EmerDNS helps to protect a website from being blocked by the authorities or any other third-parties. No one can control, modify and transfer domain name records except its owner with the unique private key. Built-in DNS server supports such DNS record types as A, AAAA, NS, PTR, CNAME, MX, TXT, and SD. You can also use EmerDNS to maintain a domain name register for I2P with the ability to transfer the domain name to another person. EmerSSH is the management system of Public Key Infrastructure (PKI) and Access Control List (ACL) built on Emercoin Blockchain. It eliminates the need for a central server, thus removing one of the main weaknesses of client-server connections. Create the bridge between OpenSSH and EmerSSH to log into multiple servers using the SSH protocol safely. EmerSSL prevents compromised SSL certificates from putting your business in danger. Because of its decentralized nature, it is not susceptible to technical failures and malicious attacks. It uses blockchain as a decentralized trust store of hash sums. It allows generating and replacing certificates locally, without any central authority. Websites with EmerSSL are not valuable to service disruption due to technical failures or malicious attacks. EmerDPO helps to ensure the maintenance of Digital Proof of Ownership. You can use it for digital services and physical goods. For example, after you write a new program protect it with EmerDPO to prevent it from being counterfeited or stolen. No one will ever wonder whether the product they bought is genuine or counterfeit. EmerLNX is a peer-to-peer text-based advertisement with the pay-per-click model of operation. It uses EMC as a payment unit for clicks on advertisements and employs EmerNVS as a distributed storage for advertising contracts. ENUMER is a VoIP service on blockchain that uses ENUM telephone records. Due to its decentralized nature, it is not vulnerable to sudden server shutdowns and human mistakes. EmerNVS forms the basis of the vast majority of Emercoin innovations. It allows storing name->value pairs on the blockchain. Name – the title of the stored data – is up to 512 bytes. Value – the data itself – up to a length of 10 kb (20*1024). Such data is immune to Man-In-the-Middle attack which makes it a reliable place to store any data, including public keys for cryptographic applications. NVS is more flexible and requires less memory to store the data. As a result, it leads to a significant increase in performance at high workloads. EmerTTS will soon become a part of EmerNVS. This service of trusted timestamps protects recorded documents from being changed or modified. Emercoin blockchain network checks timestamps and prevents any fraudulent actions. Deloitte is a multinational company providing audit, tax, consulting, enterprise risk and financial advisory services. Coca Cola Company is an American food company, the world’s largest manufacturer and supplier of nonalcoholic beverage concentrates and syrups. Hashing24 is a provider of hashpower for cloud mining of Bitcoin and Ethereum cryptocurrencies. HODL Finance is a service that provides cryptocurrency-backed loans and uses cryptocurrency as collateral. The Bitfury Group is the largest full-service blockchain technology company in the world. Eggs Datacenter is a p2p virtual server platform. Microsoft Corporation is an American multinational technology company with headquarters in Redmond, Washington. UnaDesk is a project for the construction market. Aspanta Limited is a Cyprus based company, an expert in full-cycle development software-as-a-service mobile and web applications. Authorizer is a free service that helps to integrate the system of passwordless authorization easily. I-Teco Company is a leading Russian systems integrator and provider of information technologies for corporations. PortaOne is a leading global software developer for modern telecommunication companies. Beazley Insurance Company, Inc. is a provider of professional and general liability insurance products. BDA of Latvia is an association creating a favorable business environment for blockchain companies in Latvia. Business and Technology University in Tbilisi uses Trusted Diploma, a system that helps to verify the authenticity of graduate certificates. Infopulse is one of the largest IT outsourcing companies in Europe specialized in software engineering, infrastructure, management, and cybersecurity. Foundico is a big and free-of-charge aggregation platform for ICOs and pre-ICOs. Kolionovo Ecosystem is a farm houshold built on the basis of the new model of rural economy. Lloyd’s is the oldest insurance and reinsurance market located in London. OpenNIC is an open and democratic provider of DNS services. PeerName is a company that provides registration of decentralized domain names. Risk Cooperative is a coverholder at LLoyd’s and a specialized strategy, risk and insurance advisory firm. Trust.Zone is a provider of truely anonymous VPN service. Launched in December 2013 as a fork of Peercoin. Added STUN IP discovery to remove usage centralized commercial served dyndns.org. Name-Value Storage — a universal platform for external blockchain-based services. Invented and implemented blockchain-based security services. EmerSSH, decentralized Public Key Infrastructure and Access Control List. Partnership with Microsoft BaaS program and “Blockchain Engine” app on MS Azure. First real usage of EmerDPO by the Kolionovo farm. Emercoin included in RedHat catalog of certified software. Three-in-one mining mechanism: POS + POW + merged mining. Release core wallet 0.7.0, with implemented Segwit and improved core kernel and DNS subsystem. Complete implementing ATOM — safe protocol to escrow-less peer-to-peer sell NVS-record (dns, land title, etc). Improve and popularize existing services and develop new products and services. Integrate with Bitfury’s Exonum protocol. Buy or sell EMC on EasyRabbit.net!